As central bankers and economists from around the world gather on Thursday for the Fed’s annual retreat in Jackson Hole, Wyo., most are likely to welcome Mr. Bernanke as a conquering hero….Fellow economists […] are heaping praise on Mr. Bernanke for his bold actions and steady hand in pulling the economy out of its worst crisis since the 1930s. Tossing out the Fed’s standard playbook, Mr. Bernanke orchestrated a long list of colossal rescue programs: Wall Street bailouts, shotgun weddings, emergency loan programs, vast amounts of newly printed money and the lowest interest rates in American history. 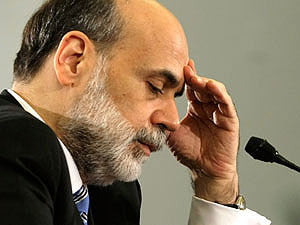 I really don’t have it in for Bernanke or anything (honest! ), but this level of adulation puzzles me. Yes, the blizzard of term facilities and liquidity programs he engineered during 2007 and 2008 was impressive, but is everyone really so sure that no other Fed chairman would have acted similarly? And beyond that, there’s pretty broad agreement that Bernanke (a) badly mishandled the runup to the crisis, (b) inherited and then perpetuated weak regulation of consumer loan products, something that aggravated the housing bubble, and (c) was complicit in allowing Lehman Brothers to collapse. These are all serious black marks, especially the Lehman fiasco, which is widely believed to have been the trigger for the most acute phase of the crisis during the fall of last year. Reappointing Bernanke would hardly be a disaster. But his judgment has been questionable on several fronts, his dedication to better consumer regulation is doubtful, and we’d all be better off if we stopped pretending that Wall Street has to be endlessly coddled by reappointing whatever Fed chairman they’ve gotten used to over the past few years. Hero worship of the Fed is a vice that’s worth stamping out, and now’s a good time to start. Let’s give someone else a chance.